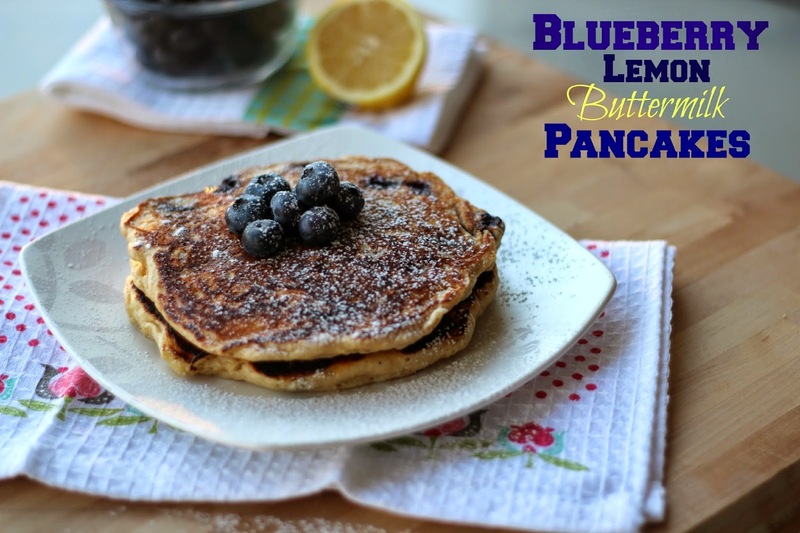 Did you know today is National Blueberry Pancake Day?!? Pancakes are never my first choice, especially when going out to eat. That is until I tried the pancakes at Mimi's Cafe. I craved those pancakes all the time. Perfectly fluffy, creamy, and didn't turn to mush when drizzled with syrup. Since Mimi's wasn't an option anymore, I was back to being indifferent about pancakes. I mean, I wouldn't turn them down, but they weren't my first choice either. That all changed though when I put this recipe together! These pancakes are the perfect combo of ingredients and are now my new favorite pancake recipe! A great replacement for the Mimi's breakfast I'm still missing. I knew National Pancake Day was coming up and I just had a basic recipe rolling around in my head. I planned on dressing them up with some props and blueberries to make the pictures pretty. Although when driving the other day, the thought of adding buttermilk to the recipe popped into my head. Directly behind it, the idea of pairing lemon with the blueberries also came. I was sold! Lemon and blueberry is a great combo to bring out this time of year when everything is dreary and gray. The end product turned out delicious! Makes 4 large, thick pancakes. 1. Mix butter, egg, and buttermilk until mixed well. 2. Add vanilla, lemon juice, zest, and sugar. Mix well. 3. Add dry ingredients and stir until just combined. 5. Add 1/2 cup or so of batter to heated skillet over medium heat. Flip when bubbles appear in batter. Let cook for 2-3 minutes and remove from pan. Top pancakes with powdered sugar or maple syrup. Disclosure: This post was brought to you by Driscoll's. I was compensated for my time and also with Driscoll's berry coupons. All opinions are my own.